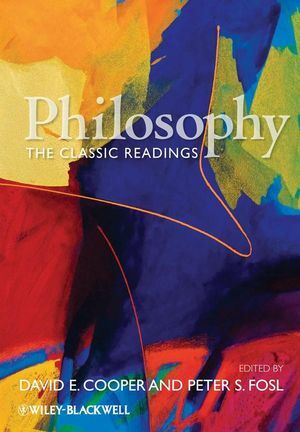 Philosophy: The Classic Readings provides a comprehensive, single-volume collection of the greatest works of philosophy from ancient to modern times. David E. Cooper is Professor of Philosophy (Emeritus) at Durham University. His many books include World Philosophies: An Historical Introduction (Blackwell, 1996, 2002); Existentialism: A Reconstruction (Blackwell, 1990, 1999); and The Measure of Things: Humanism, Humility and Mystery (2002). Peter S. Fosl is Professor of Philosophy at Transylvania University. Recipient of the 2006 Acorn Award for Kentucky’s outstanding university professor of the year, Fosl is co-author with Julian Baggini of The Ethics Toolkit (Blackwell, 2007) and The Philosopher's Toolkit (Blackwell, 2003).He is also co-editor of the Dictionary of Literary Biography volumes on British Philosophers (2002). Arranged chronologically within parts on Ethics, Epistemology, Metaphysics, Philosophy of Religion, and Political Philosophy.